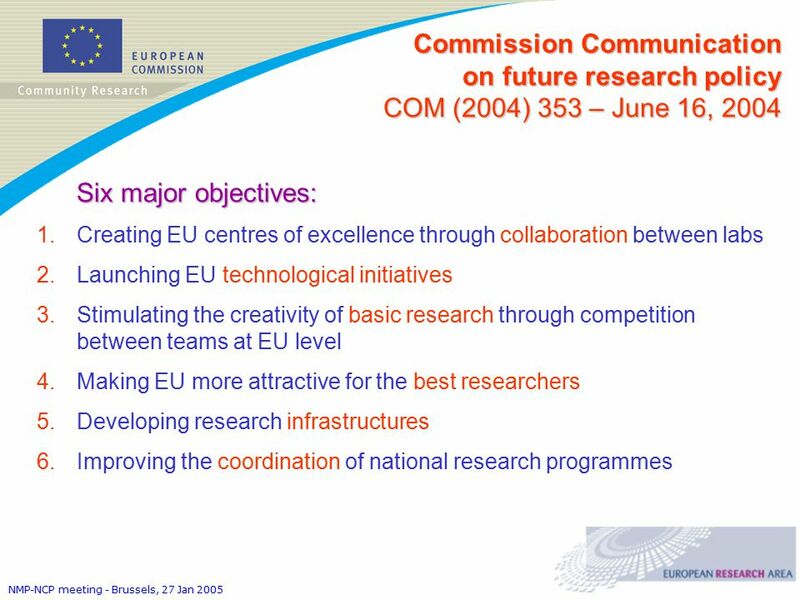 3 NMP-NCP meeting - Brussels, 27 Jan 2005 Commission Communication on future research policy Commission Communication on future research policy COM (2004) 353 – June 16, 2004 “Science and technology, the key to Europe’s future ”  Focusing future research support on 6 key challenges for Europe  Continuing and reinforcing existing activities  Developing new approaches and ensuring effective management  Launching a debate on the way forward for the 7th Framework Programme. 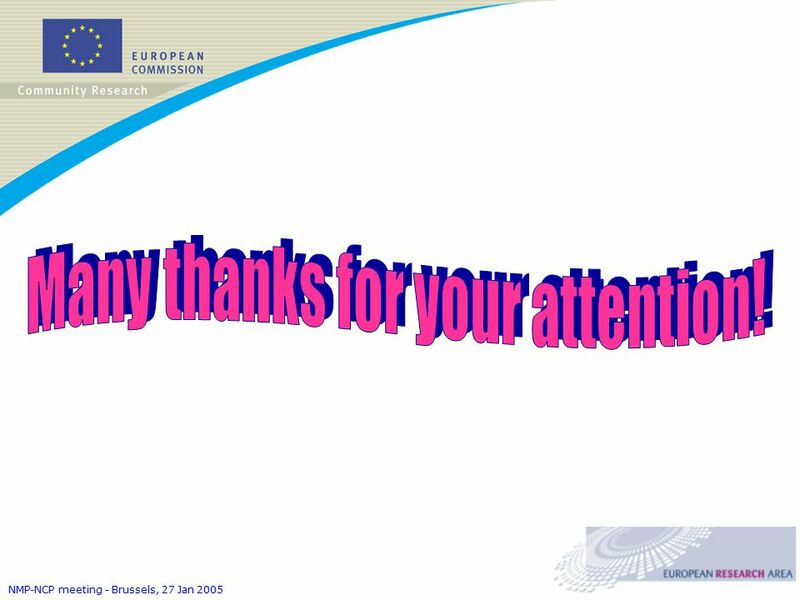 Contributions are welcome! 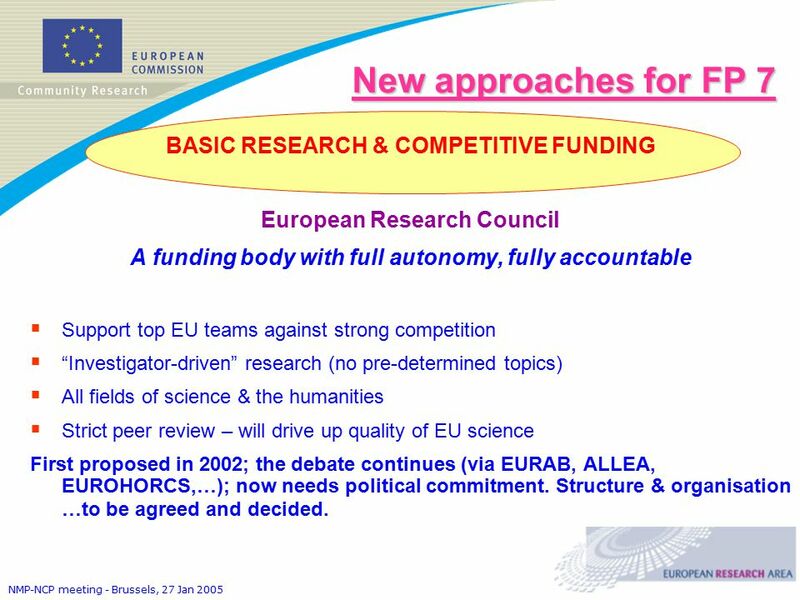 7 NMP-NCP meeting - Brussels, 27 Jan 2005 New approaches for FP 7 BASIC RESEARCH & COMPETITIVE FUNDING European Research Council A funding body with full autonomy, fully accountable  Support top EU teams against strong competition  “Investigator-driven” research (no pre-determined topics)  All fields of science & the humanities  Strict peer review – will drive up quality of EU science First proposed in 2002; the debate continues (via EURAB, ALLEA, EUROHORCS,…); now needs political commitment. 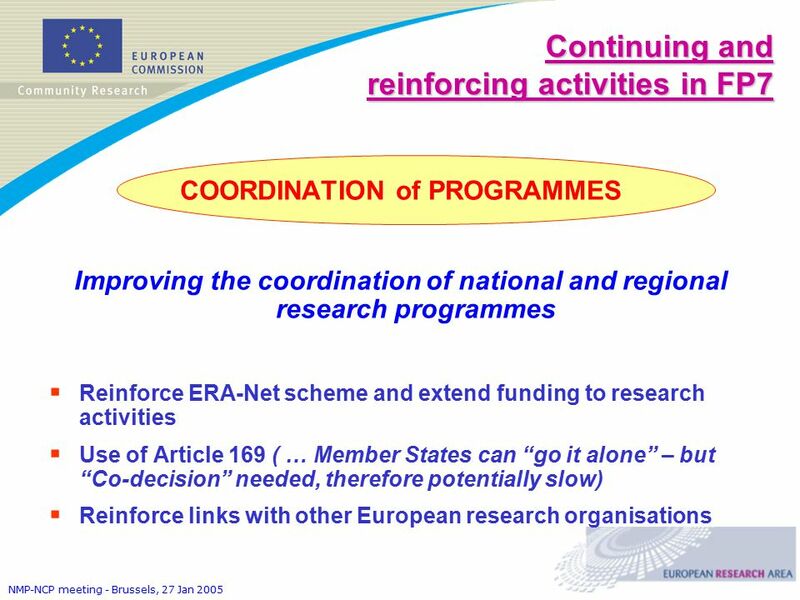 Structure & organisation …to be agreed and decided. 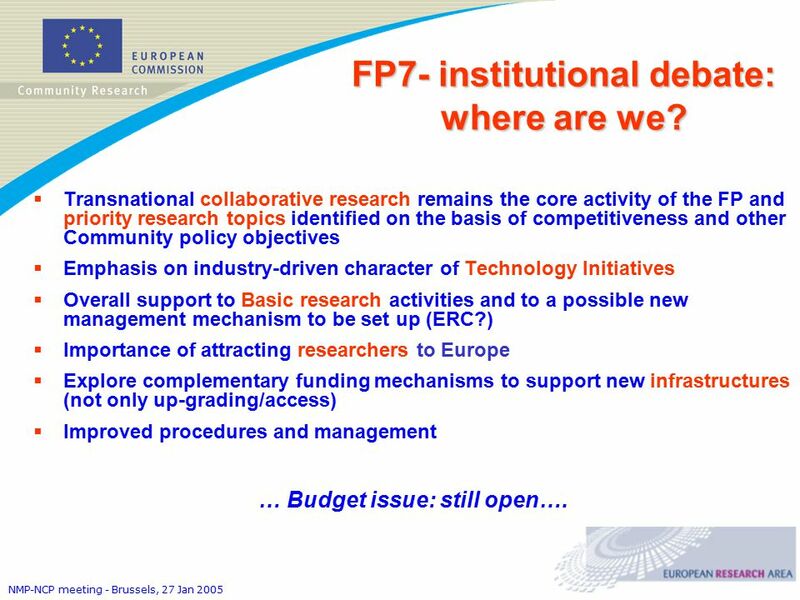 12 NMP-NCP meeting - Brussels, 27 Jan 2005 FP7- institutional debate: where are we? 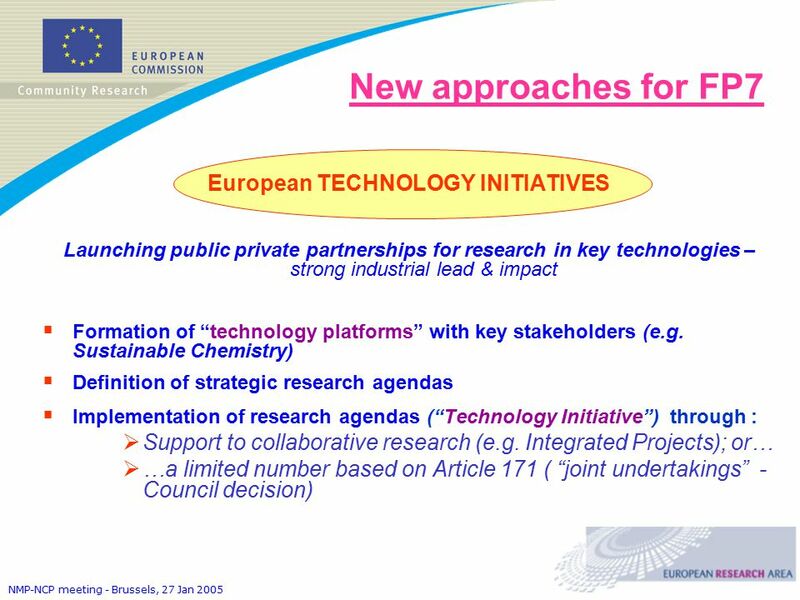 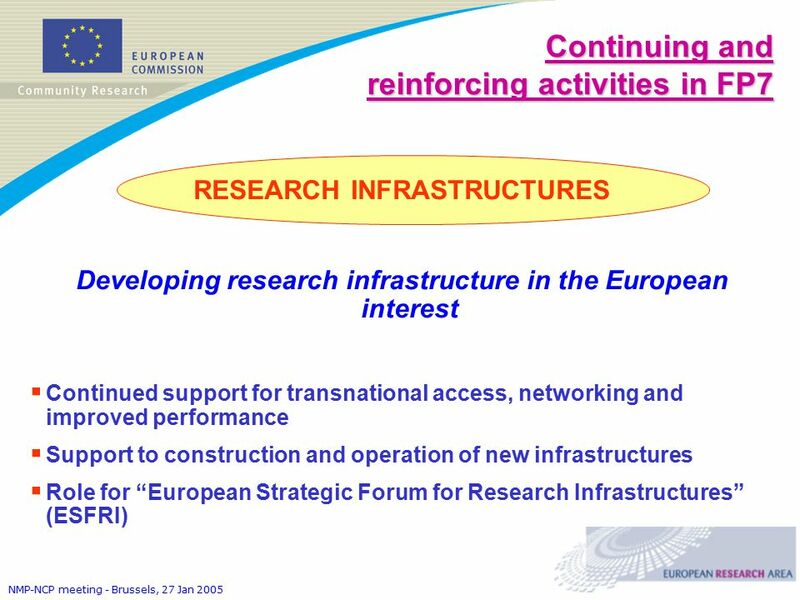 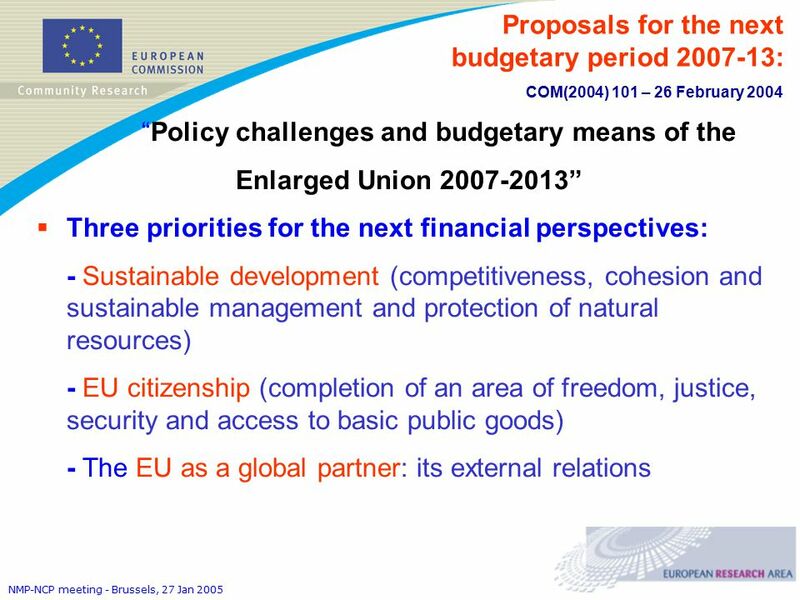 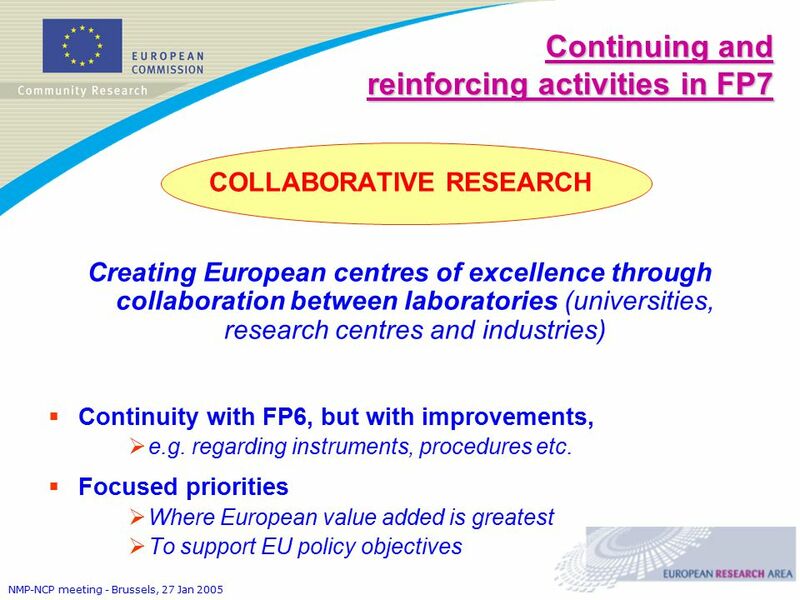 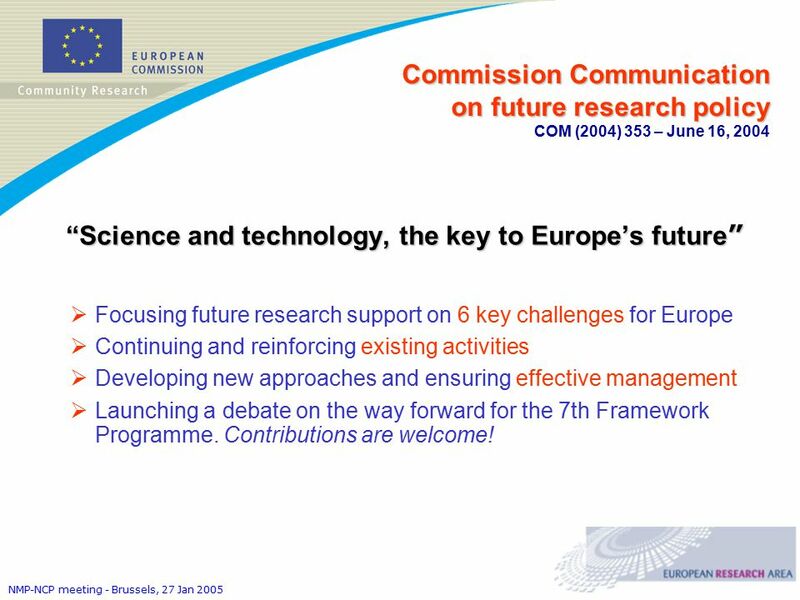  Transnational collaborative research remains the core activity of the FP and priority research topics identified on the basis of competitiveness and other Community policy objectives  Emphasis on industry-driven character of Technology Initiatives  Overall support to Basic research activities and to a possible new management mechanism to be set up (ERC?) 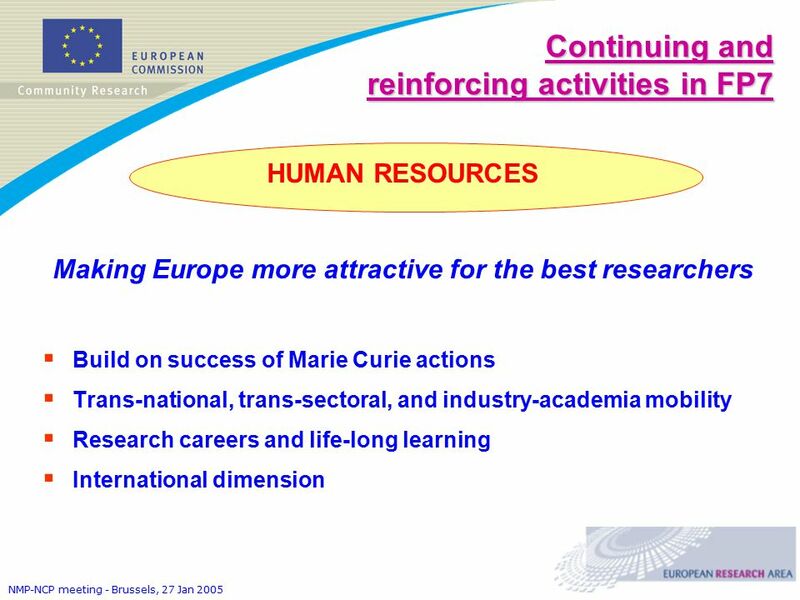  Importance of attracting researchers to Europe  Explore complementary funding mechanisms to support new infrastructures (not only up-grading/access)  Improved procedures and management … Budget issue: still open…. 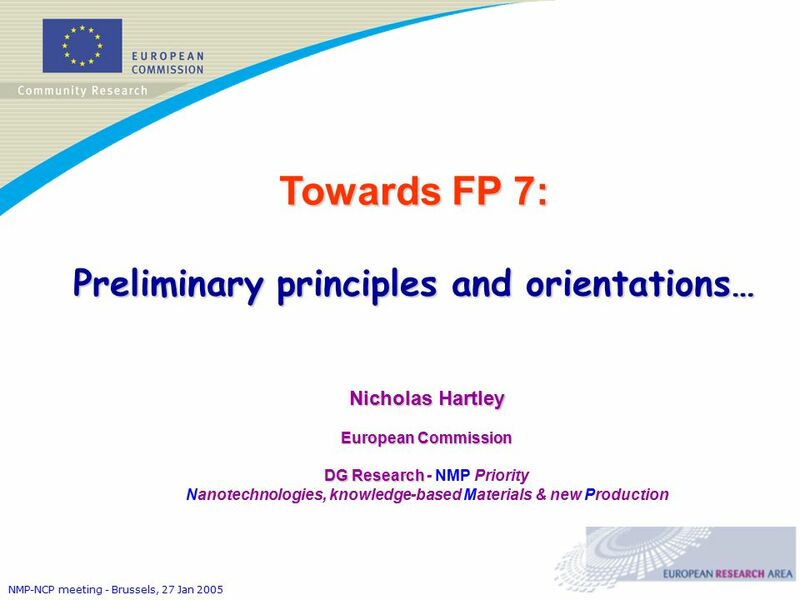 Download ppt "NMP-NCP meeting - Brussels, 27 Jan 2005 Towards FP 7: Preliminary principles and orientations… Nicholas Hartley European Commission DG Research DG Research." 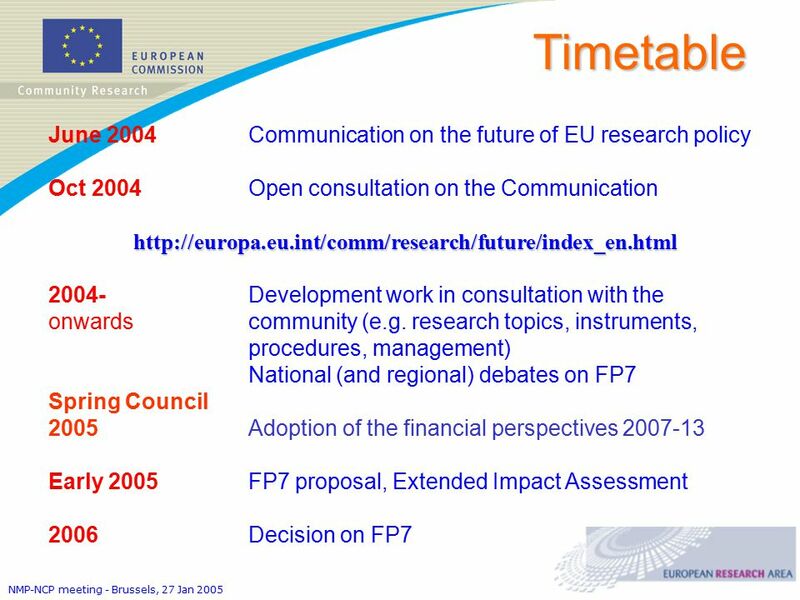 FP7: NMP topics and instruments Dan Dascalu ROMNET-ERA coordinator. 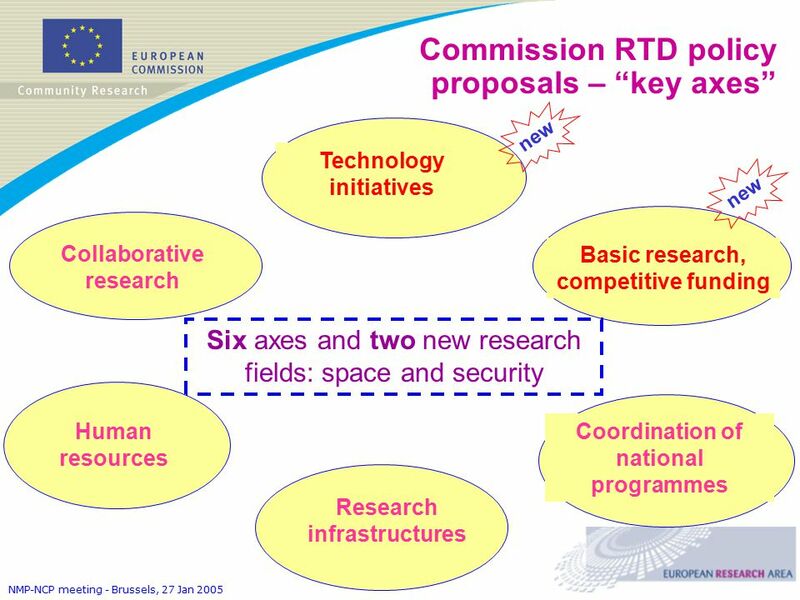 FP7 – Nov 2005 1 Towards the EU Seventh Framework Programme (FP7) European Commission Research DG.